Are we living as God intended us? My husband had read this book a couple of months ago and highly recommended it to me, and what do you know…it checks off a box on the reading challenge. Boy, was he right; it is good. But apparently everything by Jacques Philippe is great, according to a friend of mine. This was my first time reading one of his books. #1 — It’s really short — about 100 pages. #2 — It may be the most helpful book on mental prayer that you ever read. I say the most helpful, not necessarily the best. Philippe references all of the great works by saints who were quite advanced in mental prayer (Teresa of Avila, Francis de Sales, St. John of the Cross, St. Catherine of Siena, etc.). But sometimes, as Philippe notes, in our modern times we have trouble getting to the root of what these great contemplatives teach us about communing with God. Philippe was exactly who I needed to read on mental prayer, because he concisely and beautifully gets to the heart of why and how this type of prayer should be a daily habit. He essentially reminds us that silent, mental prayer is all about loving God. There is not a magic “technique” that you can manipulate, he says, because communion with God is a grace, a gift, from God. It is not something that we conjure up. Philippe says that we have to simply come to mental prayer with the intention of loving God, with humility, out of our poverty, and be faithful to continue coming daily. Before this book, I had recently read Francis de Sales’ Introduction to the Devout Life, and I was inspired by his detailed account of the steps of mental prayer, and I wanted to begin this habit in earnest. (Previous descriptions of mental prayer hadn’t be so clear for me.) However, Philippe’s book is just what I needed to read on the heels of that. It helped me develop the correct attitude toward silent prayer, to remember the ultimate purpose of loving God and entering into a deeper communion with him — as he leads. 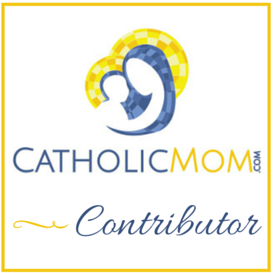 What did you read for “a book on Catholic prayer”? Need a kid-paced Stations of the Cross routine? I love the tradition of praying the Stations of the Cross on Fridays during Lent, and I love doing it in our home around our prayer table. Sometimes it’s just our family, and other times it’s us and another family or two after sharing a simple soup super. But those of us with lots of young kids can find instituting the practice of praying the Stations (and other prayers) a bit daunting. It’s hard for them to sit still for that long when they are at young ages. They just don’t have the attention span and patience (especially in the evening) for the full blown version. We have all littles (6 and under) right now, and I really desire for them to embrace this beautiful prayer practice and have it grow with them. So, a couple of years ago I created a kid-paced routine for praying the Stations — pieced together from various resources and practices I had observed other families doing. 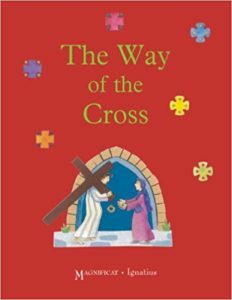 I use the children’s book The Way of the Cross as the guiding resource, which was a gift from godparents a few years back. It is so beautiful! My kids love this routine. It can be as short as 10 minutes, which is often just the right amount of time when kids are young and learning to adopt this prayer practice. When you start small, it is easy to build on a practice with time and let it grow with your family. We want our children to love prayer — not be overwhelmed by it. After all, loving should be the goal of all of our prayers anyway. Our family and friends have really enjoyed this routine, and I’m sharing it with you — just fill out the form below and you will get a PDF copy to use in your home. God bless your family’s Lenten journey!